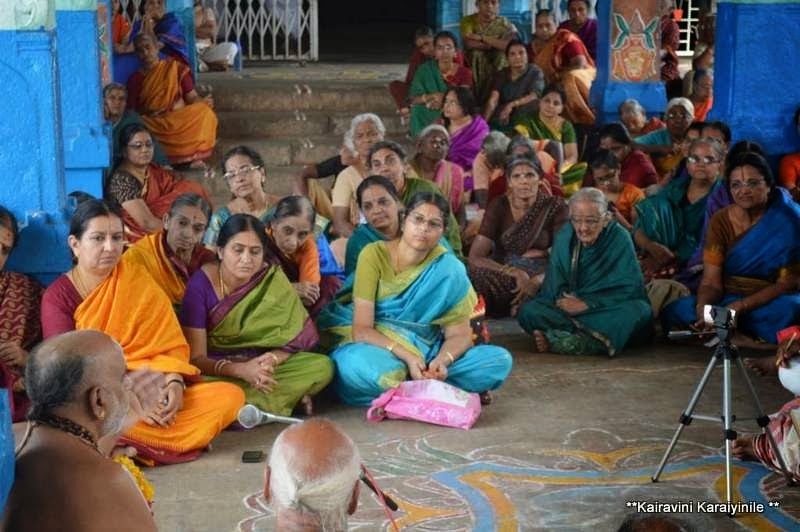 There are days which make you happy – 16th Feb 2014 was one, for it was the perfect setting….. venue : a Great Divyadesam – Occasion : listening to Sri U.Ve. 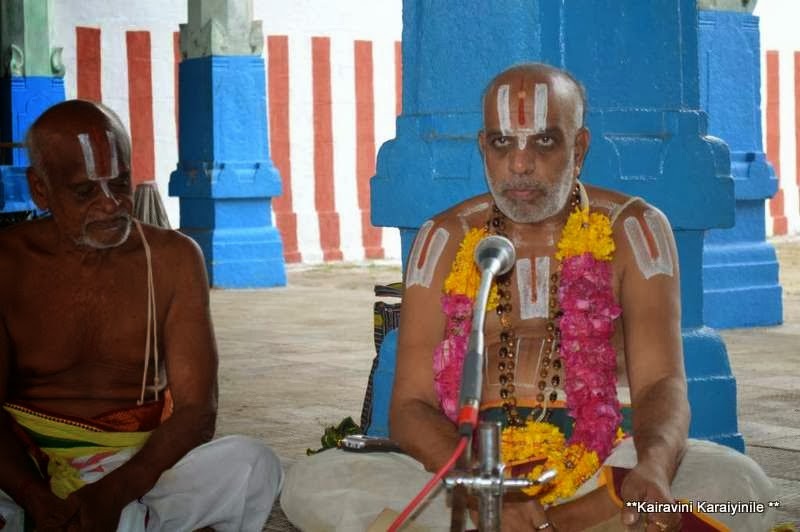 (Dr.) MA Venkatakrishnan Swami’s Bhagawad Vishayam lecture. Erudite scholar Dr. MAV swami has been delivering Bhagawad Vishyam discourse to an elite group for the past several months. Swami has a got a lucid style of keeping the listeners engrossed detailing the greatness of Swami Nammalwar’s Thiruvaimozhi keeping absolutely path of “Puruvacharyargal’ ~ as one listens, one appreciates his in-depth knowledge of Tamil and Sanskrit grammar, his memory and knack of linking various commentaries of Purvacharyargal. 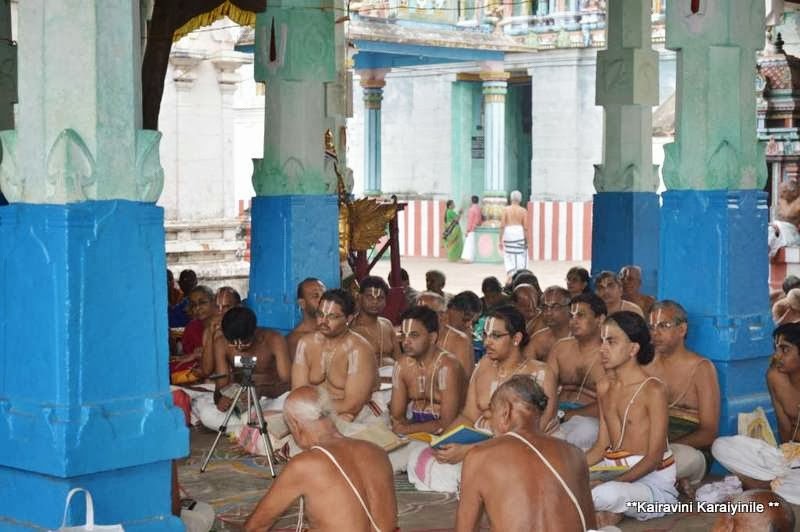 The divyadesam where we had the divine pleasure of listening was ‘Thirukannapuram” – the abode of Sri Sowri Raja Perumal. The Neelamega Perumal temple situated near Nannilam on way to Nagapattinam from Mayiladuthurai is a big imposing temple with a beautifully made pond (Thirukulam). The temple has a 7-tier rajagopuram and a vast temple complex. A separate detailed post would soon follow on this temple…. 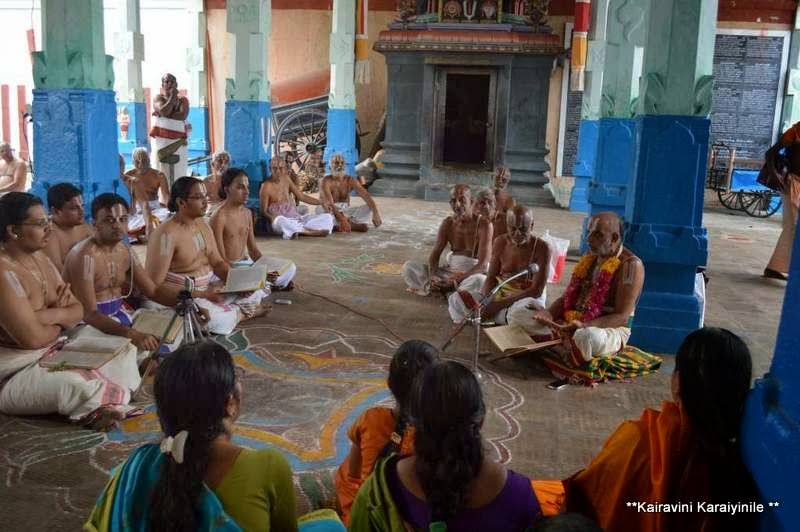 On Sunday, it was “Sarrumurai discourse of Thiruvaimozhi – Onbatham Pathu – Patham Thiruvaimozhi [9th canto – 10th set verses] – “Maalai Nanni Thozhuthu Ezhumino”……. 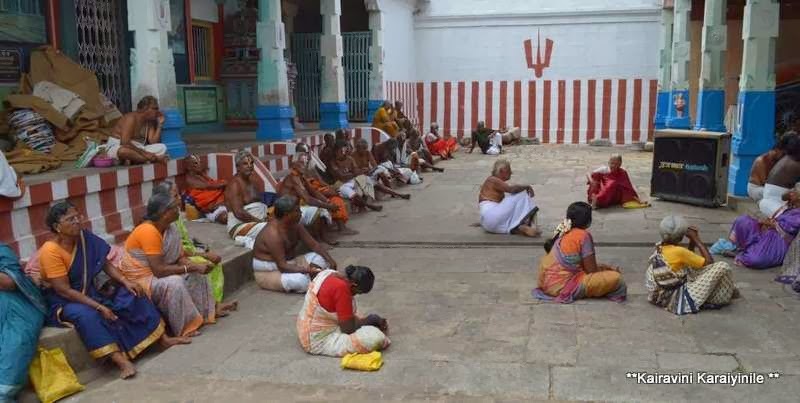 In these 11 verses Swami Nammalwar guides us to go and prostrate before the Lord at Thirukkannapuram, Who for sure would give us everything including ‘moksham’ after one leaves the mortal World. 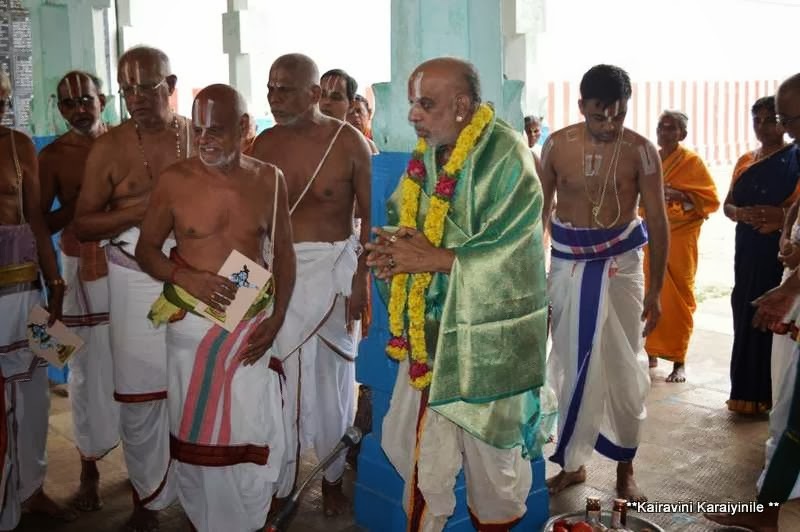 MAV Swami brought out the quintessence of Thiruvaimozhi pasurams – on Prapathi, the surrender at the Lotus feet of the Lord. MAV in his inimical style quoted from Acharya Hrudayam and Kanchi Swami explaining the primordial attributes of this great divyadesam. Hearing the discourse, one was taken to the days of Azhwar whence this Divyadesam was in its pristine glory ~ a fortified place….. Concluding the discourse MAV Swami honoured the Sthalathars and Swami was also honoured by them. His book on the most beautiful dancing Lord Sri Krishna titled “Vennaikku Aadum Pillai” was released on the occasion. 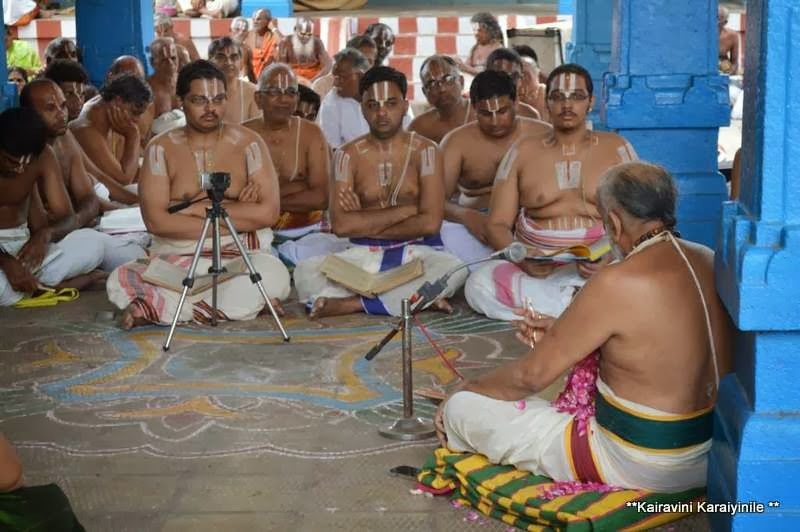 Of the many Avatharams of Lord Maha Vishnu, Sri Ramavatharam and Sri Krishnavatharam assume greater significance for their association with the greatest Ithihasams. Every little thing about Lord Krishna is very interesting especially His youth, the way He grew up and the Leelas during those early days itself….. as a very special child Lord Krishna was fond of butter and was often caught stealing (Vennai Kalavu) – as MAV describes in this book, one of the many names of Lord Kannan is ‘Vennaikku Aadum Pillai’ [the title of the book meaning : the child who dances for butter] ~ in a very lucid manner, this book has 21 high quality articles of Krishna’s deeds with butter – combining the Pasurams, explanations of Purva Acharyargal, Sthothras, anecdotes from Ithihasa and more… this book is indeed a treasure to have and read. All of us indeed felt very happy in having that golden opportunity of worshipping at so many Divyadesams, accompanying Dr MAV, hearing to the kalakshepa and spending time in a divine pervading atmosphere.